2 weeks ago we had no plans to visit the Gili Islands in Indonesia and last minute we added Gili Air to our list based on the insistence of many people we’ve met. We decided an island with no cars or motorbikes would be relaxing and that for a week or two we would do nothing before we start the rest of our Southeast Asia circuit. Plan: Visit a small island to do nothing. 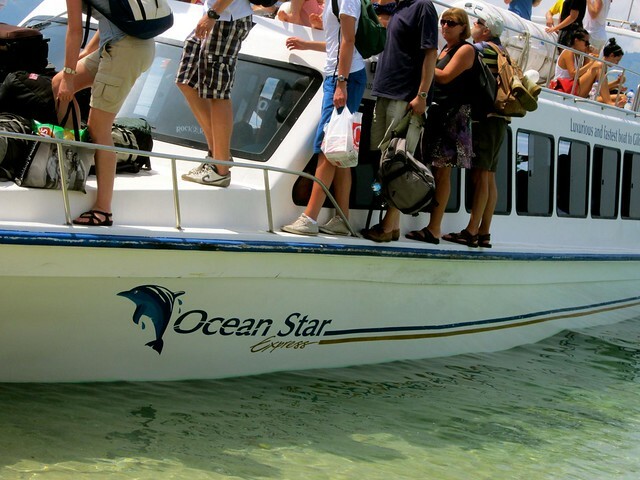 We boarded our choosen fastboat to whisk us off to one of the three small beautiful islands of the Gili’s. After searching online and emailing with a couple of bungalows, we felt most comfortable with Oceans 5. Let me point out that at this point diving has never been on any bucket list of either of ours. I am fascinated by the ocean, but have never had the urge to swim 30 feet under the water with a tank of air on my back. However we liked the response we got from Oceans 5. The energy in the email and the look and atmosphere of the bungalows seemed like a place we would like to support and stay. 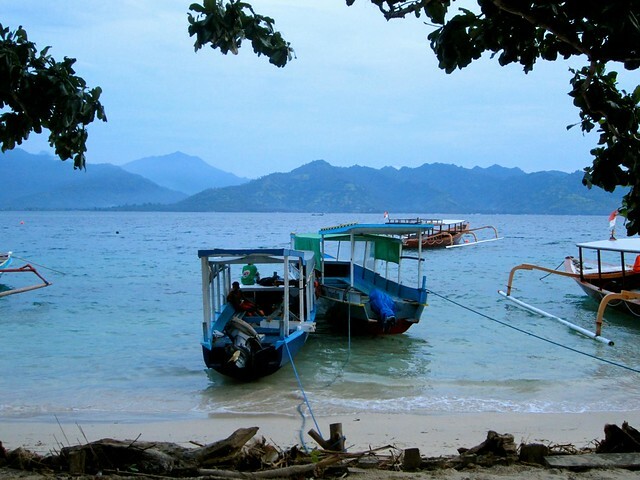 So rewind to three days ago when we arrived on the scenic island of Gili. We met this innocent enough looking gal who worked there. She mentioned to us about the diving and offered to take us in the pool if we were interested, simple as that. Not wanting to jump into anything and knowing that diving is an expensive habit to get hooked on we decided to take a walk around the island to orient ourselves and talk things over. It took us about 1.5 hours to walk around the entire island of Gili Air, mostly because I stopped every 5 minutes to either take a photo or look at a menu of one of the restaurants. Our photos turned out great from the walk, you should check them out! We get back and there she is again…smiling big, knowing exactly what she is getting us into. For the past three days our “doing nothing in Gili” has turned into three long days of 8 am – 5 pm test taking, video watching, skills testing, pool swimming and underwater breathing. My air tank was turned off under water and I had to share Josh’s air tank under water. I had to swim 20 feet without air to the surface of the ocean. My mask was taken off multiple times under water and replaced. I had to navigate with a wrist compass with currents in the ocean. I sipped air from a regulator that was free-flowing out of control. I manually inflated my BCD while in the ocean. In the midst of all this “work” I have been doing, did I mention how many turtles I swam with…and we saw a shark at only 5 meters down! I was able to breathe underwater and see a whole world of wildlife and movement that before three days ago I couldn’t imagine existed. The colors of the fish and the variety of sizes amidst the brightly colored coral all in clear blue water. The visibility in the Gilis right now is fantastic which makes our first diving experience that much better. 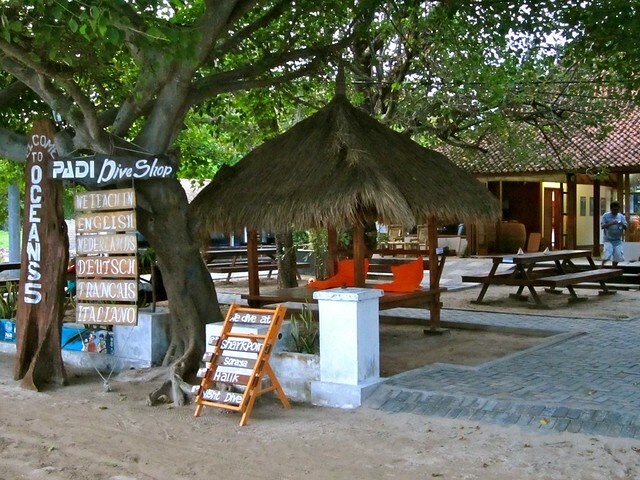 I have so much more to come about my newfound expensive hobby of diving and my love of my instructor, Fanny, and our diving school and bungalow in Gili Air. It has been a great experience and we hopefully still have a week to go! I want to hear about your favorite dive sites. We got our certification early in our trip so we can enjoy it as we go through SE Asia, S. Africa and S. America. Help us out – Where are your favorite places to dive? Definitly check out the Maldives and any reef in the Red Sea. Absolutely SPECTACULAR!! 🙂 And if you get a chance in South America, go cave diving in one of the cenotes. It’s definitly an amazing experience. You aren’t the first person that has mentioned the Red Sea – we might need to re look at our itinerary and see what we can do – If not we will definitely add it to the next trip! Komodo is the best diving i’ve done anywhere (I’ve dived in Australia, Thailand, Malaysia, Cambodia, Gilis, South Lombok, Bali, Mexico, Belize and more). Seriously if you’re in the area, don’t miss Komodo. Komodo is on the top of our list for places to return to. Indonesia in general is a place that we can’t wait to visit again. We love Fanny! She was the best instructor. We miss diving already and can’t wait to dive again!